Building a tree house is a time honored tradition for many families. One of the benefits of having a yard is the ability to build a tree fort for your children. 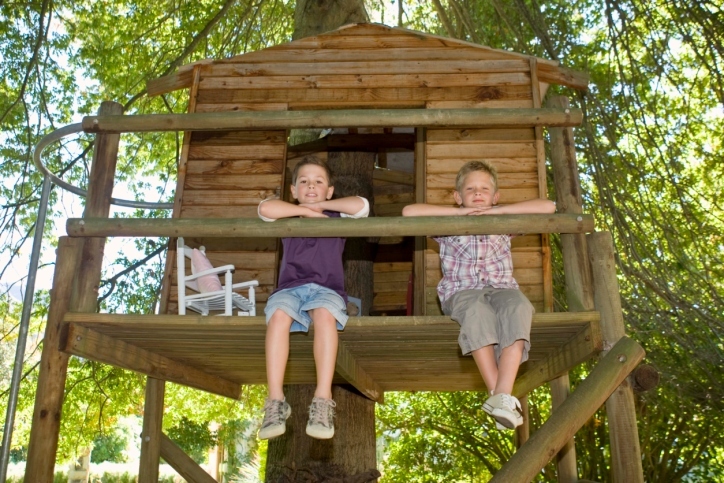 If you’re planning to build a fun fort for your kids, here are seven steps to help you create the ultimate tree house. The best projects are often the most thought out. Sit down with your children and lay the plans for their tree house. Let them contribute their thoughts and ideas so they feel a part of the planning process. Although you won’t need an engineering degree to build a quality tree fort, it’s important to calculate all the measurements and specifications of the build. Prepare the location for your future tree house by trimming away any precarious branches or boughs on the tree you plan to build on. Ensure that your tree house will be well supported, and reinforce any questionable spots. If your tree fort is being built from the ground up, make sure you’re working with a level foundation. Make sure you have all the tools you’ll need to construct your tree house. Power tools and construction equipment can be borrowed from friends and neighbors or rented from your local hardware store. When the time comes to gather your building supplies, be creative and consider re-purposed supplies. These materials are less expensive and add character and charm. You can find recycled and salvaged items at various recycled construction supply companies and through online classifieds like Craigslist. When you’re constructing your tree house, make sure it’s structurally sound. Watch tutorials online – you’d be amazed at the things you can learn from watching YouTube videos! Make sure to measure twice and cut once. Using the proper cutting tool for each cut will help you achieve cleaner, more precise cuts. Also make sure to obtain any permits that may be required for the project. Choose a theme that relates to your child. If they love fairies, use that as the inspiration for your design. Pirate forts and superhero lairs are perfect places to spark imaginative play and creativity. Incorporate cannons, cupboards and ropes with pulleys to create a unique and fun space for your children to play. When the walls are up and the building is done, it will be time to choose paint colors. Bright colors are a great way to brighten and liven up an outdoor space. You could even consider creating a mural. Choose something that fits with the theme. This is something that you and your child can do together, or that you can do on your own as an added surprise. Once your tree house is built, it’s time to get it ready for play. Decorate the space with fun decor and functional items. Throw pillows and rugs can add color and personality to a child’s play space. Window coverings can be made from scrap fabric or bed sheets. Creating a tree fort for your child is a memorable experience and a labor or love. A unique space that sparks imagination and nurtures creativity is a wonderful gift to give a child.